Elegant tabletop display plate handmade using highest quality copper. Made of solid versatile copper. Display your favorite dishes. Wide body reveals a mirror-like gleam that fits each tabletop setting. Crafted by skilled artisans from the Mediterranean (100% Recyclable - Limited Lifetime Warranty). Kuprum products are Artisanale, they are crafted with passion and great skill. They proudly carry the Mediterranean spirit to your kitchen with their quality, and to your table with their dazzling look. This product is 100% recyclable. By time, copper will naturally form a dark layer, which doesn't affect its performance. 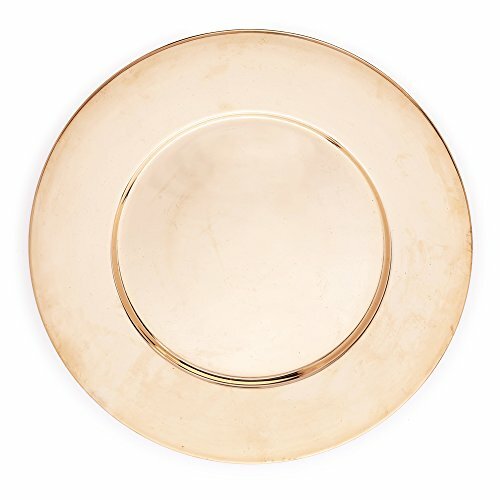 Occassionally use a non-abrasive cleaner to keep your copper tableware look new. Please use wood or plastic utensils to avoid scratching the plate. Do not use in dishwasher or in microwave. If you have any questions about this product by Kuprum, contact us by completing and submitting the form below. If you are looking for a specif part number, please include it with your message.